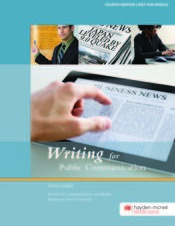 Writing for Public Communication, 4th Edition by Tricia Grindel is based upon several years of student observation and the difficulties they have when learning to write in a news story format. Utilizing input from former news writing students, this textbook is written in a format that will encourage success and is both appealing and informational for students. By giving students a solid foundation in the inverted pyramid format and improving their writing skills, this textbook addresses writing for various types of media. Grindel also dedicates a chapter to media law and identifies legal issues that writers may face and how they can protect themselves from legal action, along with defining copyright and trademark law. Writing for Public Communication will provide students with a detailed look at writing for the media and follows the Associated Press style of writing.